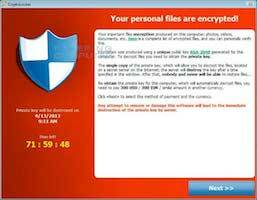 During the past couple months, ransomware known as CryptoLocker has made its presence known in homes and businesses around the world. While ransomware is not a new concept, the pervasiveness of CryptoLocker, combined with its strong encryption, make it a particularly nefarious, nasty and destructive ongoing threat. • Make sure your operating system is up-to-date with the latest security patches. • Encrypt the files you particularly want to keep private, such as documents containing your passwords or personal information, to prevent criminals from reading what’s in them. Read this useful “Ask Jack” post on the Guardian technology blog to find out more about encrypting your files.